We are very lucky in this country, we have some magnificent British countryside to enjoy in conjunction with a rich and diverse geology. Fossil collecting can be a great way to explore the natural world. Surrounded by stunning scenery, allowing you a brief disconnect from a busy lifestyle, travelling back in time to explore ancient, prehistoric worlds and the myriad of plants and animals that inhabited them. However, how to start and perhaps more importantly, where to look? These are questions that are frequently emailed to us. Fortunately, help is at hand, thanks to two dedicated and enthusiastic fossil hunters, who have set aside their geological hammers to compile a guide to fossil collecting in England and Wales. “A Guide to Fossil Collecting in England and Wales”. Written by Steve Snowball and Craig Chapman, leading lights in the UKAFH (UK Amateur Fossil Hunters) organisation, this book provides a wonderful introduction to fossil hunting as a hobby as well as containing a wealth of information and advice for the seasoned fossil collector. It’s a practical book, just the right size for slipping into a rucksack pocket and it gives details on more than fifty fossil hunting locations in England and Wales. Drawing upon their extensive knowledge, the authors take the reader through three geological eras – the Palaeozoic, Mesozoic and the Cenozoic and highlight where in England and Wales fossils, representing life from each of these eras, can be found. At the beginning of each section, a handy geological timescale in conjunction with the locations featured, permits readers to see at a glance the context of each site within deep time. The individual site entries are very informative, explaining clearly and concisely where to find fossils and what to look for. “A Guide to Fossil Collecting in England and Wales” distinguishes itself from other fossil collecting books by using a simple site summary to highlight key points regarding safe fossil collecting from each carefully selected location. Top marks to Steve and Craig, for thoughtfully adding details of the nearest postcode to many of the sites, a boon for those using satellite navigation to travel back in time. Each carefully selected location is furnished with a handy site summary. The book is illustrated with beautiful photographs of the locations as well as numerous pictures showcasing the types of fossil that can be found at each site. It is a family friendly publication, aimed at providing a stimulus for those new to the hobby to explore our country’s rich fossil heritage. In addition, the authors have skilfully embellished each entry with insightful and informative details, of assistance to even the most experienced palaeontologist. Team members at Everything Dinosaur are familiar with many of the places featured in this fossil hunting guide, but we found that there was still plenty to learn from this lovingly compiled publication. Knowledge gained from leading numerous UKAFH fossil hunting trips has been woven together to fill a gap in the publishing industry’s portfolio, here is a book written by passionate fossil collectors, for fellow enthusiasts and, for those just starting out. An essential companion for hobbyists and for more experienced fossil collectors. With a foreword from the highly-respected palaeontologist Dean Lomax, “A Guide to Fossil Collecting in England and Wales” is an essential guidebook to fossil hunting. It explains how and where to look for fossils, what tools are required and how to prepare and preserve your specimens. There is even a section dedicated to identifying and labelling fossil finds and we commend the authors for including copious amounts of information about safe and responsible collecting, as well as highlighting the Fossil Collecting Code. Straight forward guides to stratigraphy, fantastic fossil pictures and jam-packed with helpful tips and advice, “A Guide to Fossil Collecting in England and Wales”, is an ideal reference for students, amateurs, professionals and for families looking for a rewarding day out. Make room on your bookshelf for this publication, although we suspect it won’t stay on there for long, it will be out with you, providing a worthy companion to your own time travelling adventures. Advance copies can be purchased from Siri Scientific Press: Purchase “A Guide to Fossil Collecting in England and Wales” here! The police are hunting a man suspected of damaging two 165 million-year-old dinosaur footprints by attempting to make plaster casts of them. The alleged vandalism occurred at An Corran beach, Staffin on the Isle of Skye. This site is famous for its numerous dinosaur footprints and tracks that have been preserved in sandstone exposures along the shoreline. One of the three-toed dinosaur prints from the An Corran beach near Staffin (Isle of Skye). The picture above shows one of the three-toed tracks that are exposed at low tide along the beach at An Corran. The ten pence coin provides scale. The Isle of Skye is famous for its extensive dinosaur tracks and footprints. The majority of the prints located at Staffin represent the movement of large Ornithischian dinosaurs (Ornithopods). These trace fossils and others like them on the island, are helping palaeontologists to learn more about the different types of dinosaur that roamed this part of Europe some 165 million-years-ago. Last December, Everything Dinosaur reported on the discovery of a series of Sauropod dinosaur prints in Duntulm Castle Bay, around ten miles from the An Corran site. This discovery helped to reinforce the view that the sediments on the Isle of Skye preserve a unique record of the large biota that existed during the Bathonian and Callovian faunal stages of the Middle Jurassic of Europe. To hear that the actions of a thoughtless and selfish individual may have damaged these rare fossils is very sad. Sadly, such incidents are becoming increasingly common. It is not just the actions of overzealous fossil hunters, some of the recent acts of vandalism have been motivated by a desire to make money by selling fossils illegally. In 2012, Everything Dinosaur reported on the removal of fossil dinosaur footprints from a site in the Vale of Glamorgan (Wales). Dinosaur Tracks from the Late Triassic. Lochaber and Skye law enforcement officers have appealed for witnesses and have asked for anyone with any knowledge of the incident to come forward. Everything Dinosaur team members contacted the museum at Staffin for clarification of this story. The incident did involve a member of the public attempting to make a plaster cast from a footprint. However, it was a Theropod footprint that was involved and not Ornithopod as stated in the media reports. Here is the second part of our feature that highlights the favourite posts on this blog, as suggested by Everything Dinosaur team members. Yesterday, we published our review of the first six months of 2016, here is the lowdown on our personal favourites from July through to December. Summer was here, although the weather was not much to write home about, good job there were plenty of palaeontology themed news stories to keep us occupied. In July 2016, we wrote about the announcement of a new, dinosaur themed novel by the “Jurassic Park” author Michael Crichton. Cambrian suspension feeders, the brains of lungfish, a new two-fingered meat-eating dinosaur from Argentina (Gualicho shinyae) and the heart-warming story of the return of Pterosaur fossils to Lebanon. However, our personal favourite story that month came from South America, the footprint of a huge, meat-eating dinosaur, very probably an enormous abelisaurid had been discovered in Bolivia. That’s a Very Large Trace Fossil! Huge meat-eating dinosaur footprint discovered in southern Bolivia. Everything Dinosaur staff may have been busy preparing their dinosaur workshops for the start of the school year, but that did not stop them writing a blog article every day in August. The team wrote about Marsupial Lions, Chinese primate fossils, the oldest Archaeopteryx found to date, Late Carboniferous shark cannibals and, continuing the Elasmobranchii theme, that a horror film starring Megalodon would be released soon. Our favourite article was published at the very end of the month, a story about the recently described “Monster of Minden”, fragmentary fossils that suggest that some 163 million years ago, a giant meat-eating dinosaur roamed the land which we now know as Northrhine-Westphalia (Germany). Stories and features about Long-tailed Pterosaurs, how dogs assisted our ancestors, huge dinosaurs of the Gobi Desert and microbial structures that might have existed some 3.7 billion years ago helped take our minds off the shortening days and the falling leaves. However, our favourite article was published on September 15th. It described the research undertaken to reveal the camouflage and countershading of the Early Cretaceous dinosaur Psittacosaurus, just a few weeks later, team members were able to view the Psittacosaurus fossil, upon which this research was based, for themselves. Psittacosaurus photographed in the Bristol Botanic Garden. Two new species of British Ichthyosaur swimming into view, the extremes found in Tetrapod limbs, giant Titanosaurs, dinosaur brains from Bexhill-on-Sea and the fossils of an Australian prehistoric swordfish all featured in October. The article we have singled out concerns the meticulous research undertaken to identify the vocalisation organ in the fossilised remains of a Late Cretaceous bird. This study, literally provided a “sound bite” of life in the Late Cretaceous of Antarctica, around 66 million years ago. Vegavis iaai – Honking with Dinosaurs? Vegavis takes off whilst a male Theropod dinosaur vocalises close by. Picture Credit: Nicole Fuller/Sayo Art for University of Texas at Austin. Highlights last month included writing about the decoding of the Ginkgo genome, the hunt for Troodon, proteins found in fossil dinosaur claws and the myriad of new models coming into Everything Dinosaur’s warehouse next year. We focus on an article that was based on research published in “Current Biology”. The fossils of a lagerpetid (dinosaur precursor) and an early dinosaur had been discovered in the same rocks. This was the first time that this had been recorded and these fossils challenged existing ideas about when the Dinosauria became the dominant terrestrial vertebrates. The skull of the sauropodomorph Buriolestes. The article: Just When Did the Dinosaurs Dominate the Land? Fossilised bacteria shedding light on life before oxygen, the variation in body size within Australopithecus afarensis, gorgonopsids with benign tumours, Didelphodon with a bite more powerful than a Hyena, all worthy contenders for December, but we could not let the opportunity pass to comment once again on one of the most remarkable fossil discoveries made, not just this year, but perhaps this Century. December saw the publishing of a scientific paper on the discovery of part of a dinosaur tail preserved in burmite (amber from Myanamar). The exquisitely preserved dinosaur tail in amber. At Everything Dinosaur, we try and post up an article on this blog site every day. This is quite a challenge considering all our other projects and activities, however, as a result of our work on this particular weblog we have managed to build up a huge amount of information, features and articles chronicling (for the most part), advances in the Earth sciences and new fossil discoveries. Several readers have emailed us and asked us to highlight some of our own favourite news stories that we have written about over the last twelve months or so. With over 350 articles to choose from, that’s quite a tough challenge, but one we readily accept, so here are our favourites from the first six months of 2016. January 2016 saw us writing about Canada’s first Dimetrodon, dinosaur trace fossils that suggested courtship displays and the discovery of a giant crocodile’s fossils in Tunisia. However, our favourite story relates the tale of a beachcomber finding proof that enormous elephants once roamed the Isle of Wight. Fossil hunting is an activity that is not just for the professionals if you look in the right places and get lucky, you too can make an important discovery that contributes to scientific understanding. Paul and his family show off their fossil find behind an Iguanodon exhibit. There was no shortage of news stories in the shortest month of the year. During February, we blogged about Terror Birds of the High Arctic, Doedicurus DNA and the discovery of a new abelisaurid from South America, that might turn out to be one of the smallest of these meat-eating dinosaurs described. However, our favourite piece was posted up on February 10th, when we wrote about the discovery of two new types of suspension feeding Cretaceous fish. Plus, we also got the opportunity to publish a painting by the brilliant and so talented palaeoartist Bob Nicholls. Large filter-feeding fish of the Cretaceous. To read the article: Cretaceous Big Mouths! Polar dinosaurs, the demise of the Ichthyosaurs caused by climate change and a study linking the extinction of the hominin H. floresiensis to our (H. sapiens) arrival on the island of Flores, all proved very popular articles with our blog readership, but in the end, we have singled out our story about the resolution of where in the tree of life the bizarre Tully Monster sits. After six decades of debate, an international team of researchers, including scientists from Yale University, published a paper that classified Tullimonstrum gregarium as a soft-bodied vertebrate, one that is related to extant jawless fish such as Hagfish and the Lamprey. The Tully Monster had finally found a home. The “Tully Monster” is classified as a soft-bodied vertebrate. Talk about “April showers”, we were showered with press releases from museums and universities in April, leading us to blog about all sorts of weird and wonderful things – ancient arachnids, a Silurian “kite runner”, prehistoric dolphins, seed-eating Late Cretaceous survival strategies and the fifty-million-year dinosaur decline. Our favourite article, as agreed by Everything Dinosaur team members, was written on April 17th, a story about a dedicated graduate student working alongside some of the most famous palaeontologists in the world, who identified a new species of dinosaur – Apatoraptor pennatus. The presence of ulnar papillae on the ulna (bone of the forelimb) indicates the presence of long feathers on the arm. Giant Patagonian Titanosaurs, baby Titanosaurs, Atopodentatus unzipped, a new species of prehistoric dog, exquisite horseshoe crab fossils from Nova Scotia, bizarre Brazilian crocodiles and calculating the bite force of a Stegosaurus, these were just some of the stories that occupied our writing team. A favourite, was one that was published on “Star Wars day” – May 4th, tiny three-toed tracks preserved in rock indicate that some of the Theropod dinosaurs may have been very small indeed. Team members at Everything Dinosaur are aware of a growing body of evidence to suggest that some members of the Theropoda were no bigger than a mouse, we have nick-named this group “leaf litter dinosaurs”. One of these tiny Theropods ran across a stretch of mud some 125 million years ago and its prints were preserved, providing yet another tantalising clue to miniature dinosaurs, the genus Minisauripus was erected, a name for a dinosaur distantly related to Giganotosaurus and Tyrannosaurus rex, but no bigger than a sparrow. Minisauripus, potentially the smallest dinosaur known to science. To read about Minisauripus: The Smallest Dinosaur of All? Was the primordial snake Tetrapodophis an accomplished swimmer? What’s the significance of ancient rock paintings found in a remote cave 7,000 feet up in the Alps? What did the giant meat-eating dinosaur, whose fossilised tracks were found in India, look like? How do you build a museum to house the bones of the biggest dinosaurs who ever lived? These and a whole range of other questions were tackled in June 2016, but the article we have chosen to highlight involves the discovery of a new species of British marine reptile made by the English palaeontologist Dean Lomax. The new species is an Ichthyosaur (Wahlisaurus massarae), the fossil specimen “nosedived” into sediment prior to permineralisation and this unusual taphonomy prevented a new species of marine reptile from surfacing until the middle of June 2016. New species of Early Jurassic Ichthyosaur announced. Part two of this article, a list of our favourite articles published in the last six months will be posted up shortly. Interactive three-dimensional models of human joints, showing how common medical complaints have arisen and how we are likely to evolve in the future, have been created at Oxford University. The research was led by Dr Paul Monk (Nuffield Department of Orthopaedics, Rheumatology and Musculoskeletal Sciences) and it has led to the creation of a computer model of a human skeleton, one that represents a possible individual living around the year 6017 AD. This individual has been nick-named “Trillennium Man”. “Trillennium Man” plotting the evolution of key joints in the human body. Dr Monk was interested in exploring why patients at his clinic presented with very similar orthopaedic problems. A total of 224 bone specimens were scanned (CT scans), in order to assess how the human body and joints such as the shoulder, hip and knee have evolved and changed over time. Specimens from the Smithsonian Institute (Washington) and the London Natural History Museum were used in this study. Tetrapods involved in the research included members of the hominin tribe such as Homo ergaster and Homo erectus as well as a range of other fossils, including some that represent some of the very first terrestrial vertebrates to have lived. The scans were than mapped using a computer programme to produce three-dimensional images to show how the bones and joints had changed. This research has provided new insights into the morphological trends with common orthopaedic complaints such as shoulder pain and anterior knee discomfort. By extrapolating the mathematical models, the research team could attempt to plot how our bodies and their key joints will evolve in the future. Both quadrupeds and bipeds were included in the study, the research even involved examining how dinosaurs with their digitigrade and semi-digitigrade stance evolved and changed over time. As our distant ancestors adopted a bipedal method of locomotion so the femur (thigh bone) changed. The neck became gradually thicker to help support body weight. The thicker the neck of the bone in the femur the greater the likelihood of arthritis in the hip joint. Orthopaedics have suggested that this thickened neck of the femur might be a reason why our species is prone to hip problems. Neck of the hominin thigh bone has become broader to support our weight. In the picture above, the proximal end of a human femur (H. sapiens), has been modelled using the CT scans (right) and this is compared to the model produced from scans of an early hominin (left). The red arrows indicate the region of the neck of the thigh bone that has become thicker. Everything Dinosaur acknowledges the assistance of the University of Oxford press room in the compilation of this article. With Christmas day falling on a Sunday in 2016, Everything Dinosaur has made arrangements to help with the despatch of orders placed by customers over the Christmas holiday period. Our dedicated team members will be working throughout the festive holiday period, but the vast majority of the UK and international mail distribution networks will be closed down. Orders placed over the period from Saturday, December 24th up to the early morning of Wednesday, December 28th, will not be sent out until late morning on the 28th. In order to ensure a rapid despatch of orders received, customer orders will be prepared, checked and packed over this period, so that they are all ready for sending out as quickly as possible. Normal service, will of course, resume on the 29th and 30th of December. Checking parcel dimensions to ensure a prompt despatch. Both UK and international networks will take a little time to settle back into the normal working routine. Some parcels may not have moved too far in the network before the next holiday period (New Year), however, Everything Dinosaur’s dedicated staff are working hard to ensure that customer’s parcels are sent out quickly to avoid any unnecessary delays. The big day has finally arrived and on behalf of everyone at Everything Dinosaur, we would just like to wish everybody a happy Christmas. Seasons greetings to one and all. Team members will be taking a short break for the festive period, but we will be looking at our emails and sorting out orders for customers. Orders received will be sent out on the next full working day after the Christmas break, that’s Tuesday 28th December, when our annual stock take will be in full swing. Happy Christmas from Everything Dinosaur. We will be back with business as usual once the Christmas, Boxing and Bank holidays are over. A special thank you to all those very kind people who sent us prehistoric animal themed Christmas cards, gifts and drawings, they certainly have brightened up the offices and the warehouse. For those of you tucking into turkey, goose or chicken for Christmas, remember, you are eating a dinosaur! An international team of scientists, including researchers from the Chinese Academy of Sciences and George Washington University (United States), have made a remarkable discovery regarding the Early Late Jurassic Chinese Theropod dinosaur Limusaurus (L. inextricabilis). As this dinosaur grew it gradually shed its teeth and a beak formed. This is the only example of this known from the Class Reptilia, no other reptile extinct or otherwise, lost its teeth and formed a beak after birth. This research could shed new light on how birds are related to dinosaurs as well as specifically addressing the process of the evolution of beaks in the Aves (birds). The researchers propose that young dinosaurs were carnivorous, eating insects and small vertebrates, whilst the adults were most likely herbivores. Young Limusaurus dinosaurs were carnivores as they grew up they probably switched to a herbivorous diet. Limusaurus was named and scientifically described in 2009, from a series of fossils found in ancient “death traps”, muddy mires which the small, bipedal dinosaurs became trapped in and unable to free themselves, (the binomial name means “mud lizard that could not extract itself”, a reference to how this group of Ceratosaurian dinosaurs met their fate. A number of specimens are known ranging from youngsters, estimated to be around twelve months of age, to juveniles, sub-adults and more mature individuals estimated to have been approximately ten years old when they died. In total, the team had nineteen fossilised skeletons to study. Anatomical comparisons and CT scans of the jaws and skull helped the scientists identify six distinct ontogenetic stages (stages of growth). Co-author of the study, James Clark, (Ronald Weintraub Professor of Biology at the George Washington University’s Columbian College of Arts and Sciences), explained that by looking at how this dinosaur changed as it grew up, they could see that over time, individuals lost their sharp meat-eating teeth. By the time these dinosaurs had reached adolescence they were toothless and they did not grow another set as mature adults. Limusaurus inextricablis – as these dinosaurs grew they lost their teeth and they developed a beak. Seventy-eight ontogenetically variable features were identified in the specimens. Palaeontologists are aware that many Ornithischian dinosaurs such as ceratopsids (horned dinosaurs) and the duck-billed dinosaurs, change dramatically as they grow into adults, such dramatic changes in an animal’s appearance have not been extensively documented in the Theropoda. Despite the changes as Limusaurus grew up, the assessment of where this Theropod is nested in the Ceratosaurian family tree remains relatively unchanged. A juvenile Limusaurus (top) compared to an adult (bottom). The Limusaurus specimens that represented stage 1 (very youngest animals), had a total of forty-two teeth. Stage 2 had thirty-four, whilst in the most mature stages from stage 4 onwards, the specimens were toothless (edentulous). Gastroliths were found in association with larger individuals, and significantly, the size and number of the stones seemed to increase as the dinosaur matured. The presence of stomach stones indicates a herbivorous diet, a switch from meat-eating to plant-eating as the dinosaur grew up was also suggested by carbon and oxygen isotope analysis from bone samples. Bone carbon and oxygen isotopes show a change in diet for Limusaurus as it grew older. The diagram above shows the carbon/oxygen isotope analysis from the Limusaurus fossil material. Blue polygons show the ranges for herbivorous behaviour, whilst the red polygons show likely carnivorous feeding behaviour. The various Limusaurus ontogenetic ranges are plotted. Growth stages one to three indicate likely meat-eating habit in young and juvenile Limusaurus specimens, with a switch to a plant-eating diet (later stages). The data is plotted alongside meat-eating, plant-eating contemporaries of Limusaurus from the Upper Upper Shishugou Formation (Oxfordian faunal stage of the Early Late Jurassic). The dashed lines represent the data related to sub-adult Limusaurus. Limusaurus belongs to that part of the Theropoda that is believed to be closely allied to the evolutionary ancestors of the birds. Dr Clark et al in the formal description of this dinosaur in 2009, described the species’ hand development (manus) and noted that the reduced first digit might have been transitional towards the digit configuration of modern birds (digits II, III and IV). This new data could help scientists to understand how birds lost their teeth and the beak evolved. The research was performed by Shuo Wang of the Capital Normal University and Mr. Stiegler under the guidance of Xu Xing of the Institute of Vertebrate Palaeontology and Palaeoanthropology, and Dr Clark. A National Science Foundation grant funded the research. A team of international scientists including researchers from the New York Genome Centre and the University of California Berkeley, have analysed the genome of a population of Inuit from Greenland and identified components that may originate from the Denisovans or a related archaic human species. The “caveman” genes have helped these people adapt and survive in cold climates. In the first genomic analysis of Inuit people from Greenland, the scientists scrutinised two genes, namely TBX15 and WARS2 that seem to be a close match to an archaic human genetic variant, potentially Denisovan or some other closely related Denisovan-like species that has yet to be found in the fossil or anthropological records. TBX15 is known to help the human body cope with cold temperatures and influences the distribution of body fat, whilst WARS2 encodes the mitochondrial tryptophanyl-tRNA synthetase and may have a role in managing blood vessels associated with the heart. The Inuit are collection of culturally similar peoples that inhabit the Arctic regions of Alaska, Canada and Greenland. Although widespread throughout the Arctic Circle, most anthropologists believe that the ancestors of the Inuit people originated from Siberia. The Inuit have made their home in one of the harshest environments on Earth and their traditional lifestyle is based around hunting. As a result, their diet is rich in protein, low in carbohydrates and despite the lack of agriculture and plant cultivation, the people derive vitamins and other trace elements essential to health from fish/meat based foods supplemented by seasonal berries, herbs and edible seaweeds. The Denisovans are a third species of hominin, closely related to Neanderthals but distinct enough to be regarded as a separate human species. In 2008, scientists excavating 40,000-year-old cave deposits in southern Siberia, unearthed a single tooth and a tiny finger bone. The tooth can from an adult human, the finger bone from a child. Genetic analysis of nuclear DNA extracted from the digit gave the researchers quite a surprise. When this DNA was compared to that genome of modern humans and Neanderthals, it was different. Here was evidence of a new species of hominin that lived until quite recently. This new species was named “Denisovan” after the cave in which the bone and the tooth were found. The Denisovans, evidently had brown hair, eyes and dark skin, at least, this is indicated by the genetic information retrieved from the single finger bone. 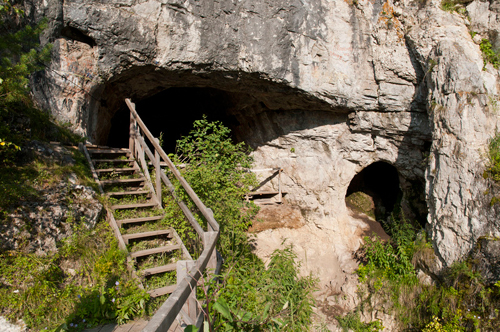 A view of the entrance to the cave, inside which, fossil evidence of Denisovans was found. Intriguingly, geneticists have also found an overlap between the Denisovan genome and that of some modern groups of Asians and Pacific Islanders. A number of theories regarding this have been put forward, for example, it has been suggested that Denisovans living in eastern Eurasia interbred with modern humans that were migrating into the region. When these modern human pioneers reached outlying islands of the Asian continent such as Papua New Guinea, they brought the mixed H. sapiens/Denisovan DNA within that population, leading to the “echo” of Denisovan DNA found today. Other researchers have argued that the enigmatic Denisovans were much more widespread, ranging far across Asia, although the lack of fossil evidence and calculated genetic diversity contained within a population, indicates that Denisovan numbers were never very high. Further information regarding the spread of modern human species and the influence of archaic human lineages on the genomes of modern people: Out of Africa Earlier Than Thought! The research team analysed the genomes of around two hundred Inuit from Greenland in order “to identify genes responsible for biological adaptations to life in the Arctic.” They conclude that the Inuit variant of the TBX15/WARS2 region first came into modern humans from an ancient human line. Ancient human tooth, ascribed to Denisovan. Passing on genetic material due to interbreeding between hominin species, that favoured modern humans and helped them adapt to harsh environments is not a new phenomenon. The modern-day inhabitants of the Tibetan plateau are able to cope with living at high altitude as they have a gene variant that enables them to regulate their production and use of haemoglobin more effectively. Genetic analysis suggests that this characteristic came from the Denisovans. Just three more sleeps until the big day! Everything Dinosaur team members know how stressful this time of year can be for mums, dads, grandparents and guardians of young dinosaur fans. Take for example, an email received along with an order that arrived in our inbox just after 5am this morning. Mum had only just got her little boy’s Christmas list last night and he had asked Santa Claus to give him a Tyrannosaurus rex face mask as a present. A T. rex face mask. Not to worry mum, we have been up even earlier than usual this morning, just in case something like this might happen. The parcel will be checked, packed and despatched in double-quick time. In fact, rather than wait for a collection from the warehouse, this very important package, along with all the other orders that have come in overnight will be taken to our local post office this morning by a team member. These parcels will all go out with the first collection from the post office this morning. We know it is getting very close to the big day and that Royal Mail have stated that the last guaranteed posting date for Christmas delivery for first class letters and parcels was yesterday (Wednesday 21st), but our dedicated staff are doing all they can to get parcels to customers in time for the big day. Our prompt packing and despatch should give these customer orders every chance of making it in time. Nothing is guaranteed, especially with the current industrial action in the UK mail network, but at least Everything Dinosaur can be relied upon to get orders packed and sent out as quickly as possible, with the minimum of delay.